Continuing on the Sunday food fest with Hagan (started with brunch at Public), I joined him later on the afternoon at Luke’s Lobster. If you have read Hagan’s introduction about this stop earlier, I have indeed told him that I’m probably the last NYC-based food blogger who’s eaten their lobster roll. I know, I hang my head in shame. I had my reluctance since the Interwebs were inundated with hype that are either true or false. For example, Porchetta had glowing reviews from many different bloggers and a few respected food journalists when it opened within its first week but I didn’t love it so much, hence my reasoning of holding back from trying Luke’s. When I entered this place, it was really a small “lobster shack” as they billed themselves. 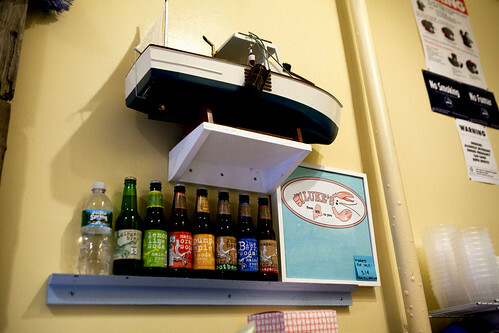 It’s a narrow storefront with a U-shaped counter seating near the windows and the register in the back where you order, all adorned with pale yellow walls with some novelty seafood fishing decor. But the hype has truth to it. When the staff at Luke’s bestowed us with this gorgeous lobster roll, I was enamored at the first bite. 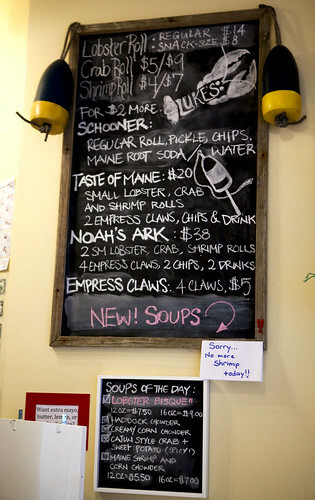 The cocktail bun was buttered and toasted to perfection and it’s stuffed with four ounces of large chunks of perfectly cooked lobster and its claw. Then lightly dressed with a schmear of mayonnaise (on the bun), and drizzled with melted butter, lemon juice, and simply spiced with dried oregano, thyme, salt, pepper, and celery salt. The minimalist approach for the filling let the freshness of the lobster speak for itself. 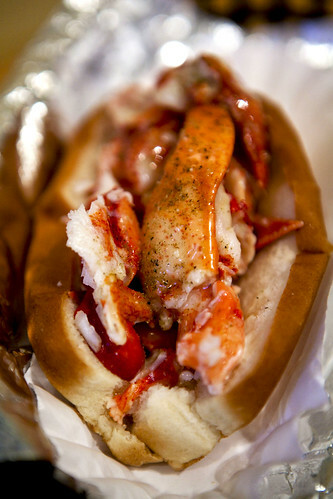 I wish more lobster rolls were like this (less filler and/or mayonnaise). It was amazing and if I hadn’t eaten so much earlier this morning, I would’ve eaten another roll or two. Also, Hagan and I split the lobster bisque for the sake of curiosity. I never encountered lobster bisque filled with that much lobster before and the soup was well spiced and creamy. One can tell there is a lot of love and care for fresh ingredients and the minute details that goes into the food makes a huge difference. Thanks again to Hagan for inviting me to 93 Plates. Thanks to Luke, his father Jeff, and the general manager Ben for being gracious hosts.